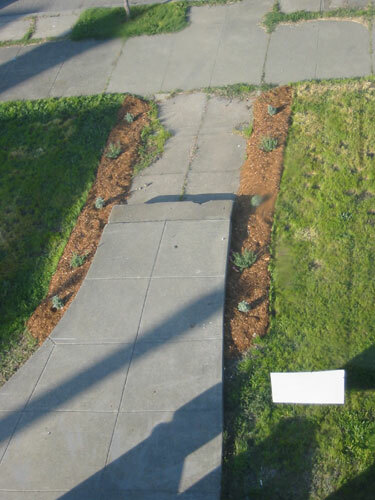 While I was taking that picture, I snapped a photo of the new lavender walk that I put in last weekend. It's looking nice, still, despite the neighborhood cats' attempts to ruin my tidy bark mulch. Today's garden job was installing some foundation plantings. 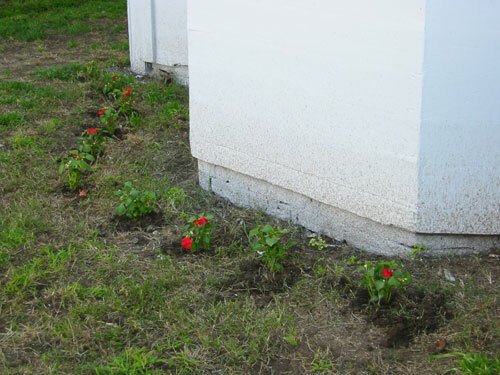 I stopped at the nursery on the way home from my printing class and bought a couple flats of red impatiens (a nice cheap flower, grows fast, likes shade, and it won't kill me to see it blown away when the foundation work gets done). A few quick minutes later we had flowers around the base of the house. The idea is to make the house look nicer for the assessor, so she will value the house well, and we'll get a huge second mortgage that we can use to redo the foundation and rebuild the roof, and maybe also to pay for The Shed. While I was at school, Noel did a ton of yard work. 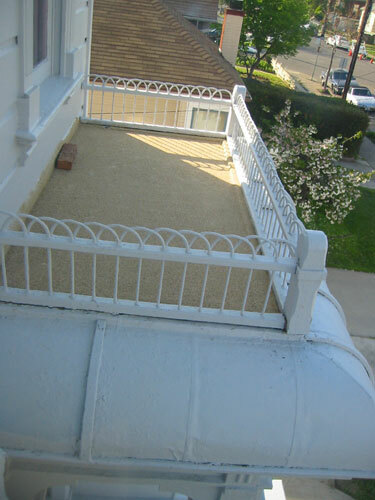 He mowed front and back, whacked weeds, and cleaned up the painters' mess. The yard looks a hundred times better when it's being mowed regularly. He's also been applying this "Feed and Weed" stuff in the morning, which is a combination fertilizer and weed killer. We're hoping that helps with the weed problem. I've been augmenting it with manual weeding, but most of the lawn is broadleaf weeds, so it makes it look bad. Right now Noel's putting in an outlet over the kitchen workspace for me, so I don't need to use an extension cord for the Kitchenaid. I guess it's also for him, because he does do most of the cooking, and sometimes uses my extension cord for the mixer. I'll have photos of that process later.